A great talk, now accessible as a book! I loved re-reading such a phenomenal book with thought provoking statements that lead me to the call of action. I really love Bonnie L. Oscarson, and I love that she recognizes that women will and would do well to have a desire to serve each other better and love each other better. As we do so, we will become more unified together as we progress the work of the Lord. We really are errand of angels. So, I am glad I got to brush up on that reminder and apply more meekly and willingly to my life. This book is full of beautiful insights and thoughtful passages of love. Reminding us all that our differences are what makes us special in God's eyes. Who are we to criticize or judge others? I love listening to Sister Oscarson's talks. She has a presence about her that is very inspiring and I can tell that she is a remarkable woman. I truly enjoyed this book. "We need to care for each other, comfort each other, and [be] there for each other." "As we look beyond our differences in age, culture, and circumstance to nurture and serve one another, we will be filled with the pure love of Christ..."
Received a hardcover copy in exchange for an honest review. This is one of those talks adapted to a book that every sister should have! I had forgotten these treasured words just weeks after Bonnie Oscarson delivered them, and I'm glad I was reminded of this valuable message! This is an excellent Mother's Day gift. 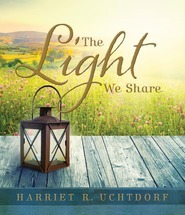 This book is based on a talk that Bonnie L. Oscarson gave in April 2014 at the General Women's session of conference. It is a short book that discusses the fact that, even though as women we are in different stages of life and have many other differences, we really and truly need each other. She shares small examples of ways we can serve, nurture, teach and reach out to each other. If there are barriers, we are the ones that have created them. She also quotes former Relief Society general president Bonnie D. Parkin when she said, "I invite you to not only love each other more but love each other better." I enjoyed the artwork, too, especially the picture of three generations of women's hands--a small girl, a mother and a grandmother with the statement, "There is no age barrier when it comes to Christlike service." This is a great book to display or give as a gift as it's a great reminder to us women that we need each other! A wonderful little book - perfect for gifting! Sister Bonnie Oscarson has been one of my favorite conference speakers. She is always so insightful and has such loving, kind advice for women. In this little book, What Makes Us Sisters, Sister Oscarson asks all women to look carefully at one another and recognize that, while we are not all the same, we are all sisters in Christ and we all have great potential. It is filled with inspirational pictures. It is a "gift sized" book (measuring 6.5" by 6.5") perfect for giving in a welcome basket, a special friend who needs to be uplifted, or mothers day!